We’ve all gotten a craving for crispy, crunchy, salty, spicy fried pickles at some point right? Whether or not it’s after we’ve had a couple drinks is neither here nor there, we just know that sometimes that urge hits you for amazingly tasty bar food and it’s up to us to get ourselves to our favorite local joint where we know the pickles will be fantastic…at least that used to be our plan; we recently decided to switch things up a little and make our own fried pickles – an excellent decision if we do say so ourselves. Instead of fried pickle “chips,” or sliced pickles, we figured why not just fry the whole pickle spear? We picked out our favorite pickles (feel free to get creative with the jar you pick; maybe something with some tasty seasoning added in there like dill or jalapeño), then put together an easy dredging station with a flour mixture perfectly catered to our tastes. Bring some oil up to around 365º F and then get frying! Each spear only needs a couple minutes before it’s golden brown, then all you have to do is mix up a dip of your choosing – you can’t go wrong with ranch and hot sauce, which is our go-to. 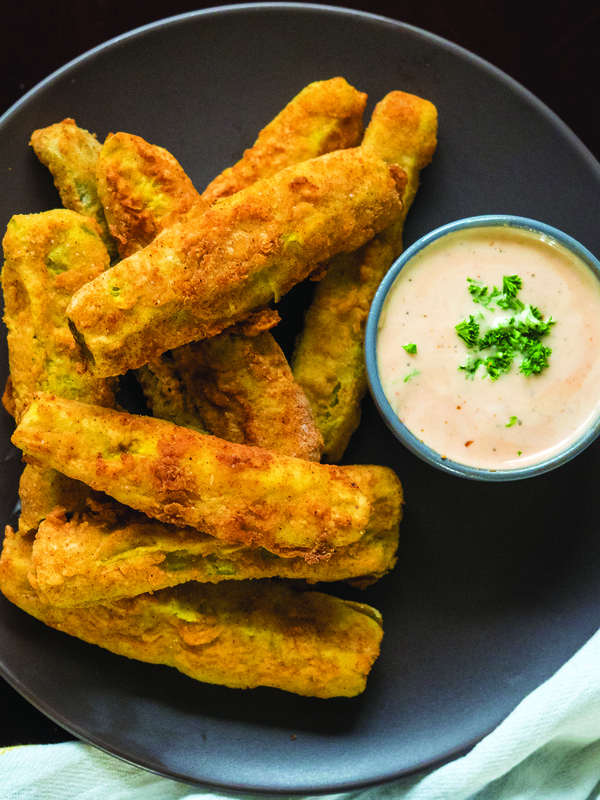 All combined, this is an easy, tasty snack that will have everyone raving; plus, knowing you can make your own fried pickles that easily rival the ones at your local pub is always a fun confidence booster! Heat a large pot filled with 2 inches of vegetable oil over medium-high heat until roughly 365º F.
Remove pickles from jar and set them out on paper towels, topped with a layer of paper towels, to drain. In a medium bowl, whisk together milk and egg until smooth. In a separate bowl, whisk together flour, garlic and onion powders, paprika, salt and cayenne. Take dried pickles and coat each one in flour. Shake off excess, then dip each in buttermilk mixture. Shake off excess again and re-roll in flour mixture. Working in batches of 3-4, carefully lower pickles into hot oil and fry, rotating frequently, for 2-3 minutes, or until golden brown. Use a slotted spoon to scoop out pickles and transfer them to a paper-towel lined plate to drain. Repeat with remaining pickles. For dip: whisk hot sauce into ranch dip and serve immediately with hot pickles.